Leading British car manufacturers, Jaguar Land Rover, are introducing innovative technologies that will allow autonomous cars to drive themselves over virtually any surface or terrain. The Prius is among a 37,000-vehicle recall by Toyota New Zealand, part of a global recall by the company that affects 2.8m vehicles. The threat of a fuel leak is forcing Toyota New Zealand to recall nearly 37,000 cars, part of a global recall of 2.8 million vehicles. Volkswagen would repair or buy back polluting diesel vehicles and pay each owner as much as $10,000 under a $14.7 billion ($NZ21b)deal the car maker has reached to settle lawsuits stemming from its emissions cheating scandal, a person briefed on the settlement talks said Monday. 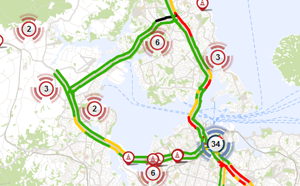 Auckland drivers are already fed up battling traffic congestion. Then a recent Southern Motorway bridge strike heightened those frustrations. A group of Kiwis is throwing their support behind a campaign calling for tourists to drive with "T-plates" on their rental cars. The founder of the "T-Plates for Tourists" movement said tourists should have to pass a test before they can drive on New Zealand's challenging, distracting and often unforgiving terrain. Transport officials have ordered two Uber drivers off the road and warned others about breaking the law. They've also issued hundreds of warning letters to drivers thinking of working for Uber while other complaints about the app-based operation are under investigation. Traffic congestion is causing many Aucklanders to look at moving house, changing jobs or even leaving the city altogether, according to a new survey of Auckland AA Members. Mitsubishi Motors Corp., the Japanese automaker that acknowledged that it had intentionally lied about fuel economy data for some of its models, said an internal investigation found such tampering dated back to 1991. In a freak accident, a pole carrying high voltage power lines fell on the car of an 89-year-old war veteran in Paihia, who thought he and his wife were about to be fried. His car was scorched from end to end, but the couple emerged unharmed after Mr Sisley kept driving his car until he was free of the lines. A unique, new dash-mounted camera not only records what’s happening on the road ahead, it can also prevent an accident and even help avoid being ticketed for speeding or running a red light. The revolutionary Thinkware Dash Cam’s special technology incorporates a Front Collision Warning System which can alert the driver when approaching too closely to a vehicle ahead. It also has a Lane Departure Warning System to warn of straying from a marked lane on highways or motorways.